So get this, Indonesia is made up of over 17,000 islands with strong Hindu, Dutch, Portuguese, Chinese and Middle Eastern influence. The country is one massive colourful fabric of different races, languages, ethnicities: over 300 ethnic groups are united under the mighty Indonesian archipelago. Nasi goreng is a popular Indonesian staple, kind of like what pad Thai is to Thailand. Nasi means rice and goreng means fried. A nasi goreng usually includes meat (usually chicken), vegetables, cooked with spices, shallots, garlic, tamarind, chilli, served with sweet soy sauce seasoning and crackers. There's a lot of cross over with the Malaysian cuisine, particularly on Borneo island which shares borders with both countries. We tried our first nasi goreng here and of course many many more when we visited Bali, the Gili islands and Flores. Nasi campur is said to be the National dish and certainly one of the best traditional food of Indonesia we tried. It means mixed rice and it is literally that: rice served and mixed with a variety of local dishes, like chicken satay, grilled chicken, beef rendang, vegetables, salad and prawn crackers. A nasi campur meal reminded us a bit of an Indian thali in that it is a tray with lots of different local prizes. Chicken satay barbecued in the streets are a quick, cheap and very tasty Indonesian treat. This is a Muslim country so they will mostly be chicken or beef, unless you go to a Chinese owned restaurant who is more likely to serve pork satay. 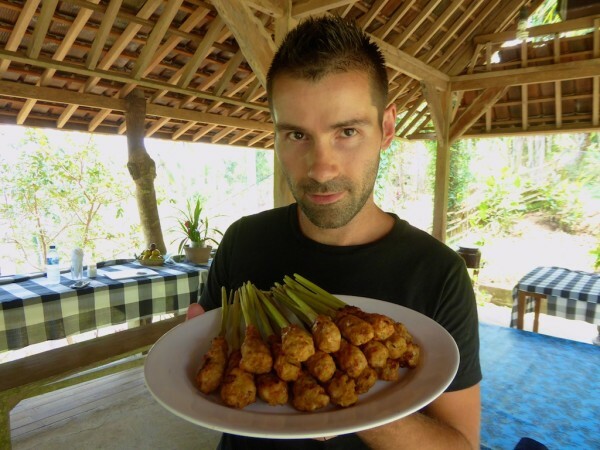 We tried a more unique type of beef satay, which were folded and cooked around lemongrass sticks at our cooking class in Ubud, Bali. The Royal Rijstaffel is a Balinese tradition dating back to the Dutch colonial era of the 19th century and literally translates as rice on table. The rice is served with a variety of accompanying local dishes by a group of female waitresses who dance their way over to you, accompanied by traditional music. The local dishes are Indonesian but the rijstaffel originates from the colonial Dutch who introduced it to impress visitors with the exotic abundance of their colony. Babi guling is a pig roast and literally involves barbecuing an entire pig. it is a specialty from Bali and reminded us of traditional Filipino food, lechon. Bali has retained its Hindu influences, which is why such a dish is popular in a predominantly Muslim country where pork is not eaten. The babi guling is stuffed, then cooked with spices ranging from lemongrass, black pepper, turmeric, coriander seeds and garlic. Gado gado is an Indonesian salad comprising vegetables in a spicy peanut sauce, often served with fried tofu and a hard boiled egg. Gado comes from the verb menggado and means to consume something without rice. Gado gado in Indonesian literally means mix mix and refers to the fact that this is a rich mixture of vegetables (like potatoes, beans, bean sprouts, spinach, corn and cabbage), along with tofu and eggs, mixed with a peanut sauce. Tempeh is great stuff for vegetarians who still want a good protein source. It is made from fermented soy beans and originates from Java, one of the largest islands of the Indonesian archipelago. It has a higher content of protein, fibre and vitamins. 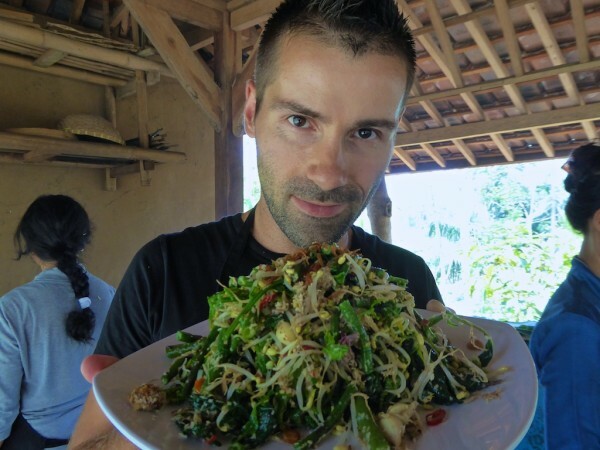 In Ubud, we tried a delicious vegan tempeh toast salad at the “Fresh Raw Vegan” restaurant. We saw tempeh and tofu being produced from scratch at the Merombok village on Flores island then sold in mass to the local villagers. 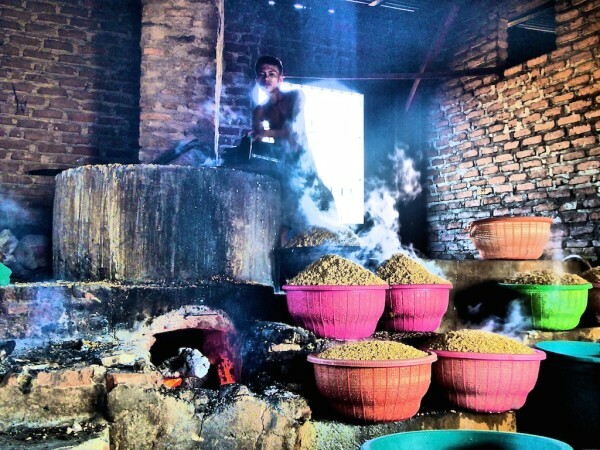 There was something so peaceful about watching all those baskets of tempeh fermenting away with the heat from the stove rising and the young local boy in the village working hard in the background. Indonesian sayur urap is a blanched vegetable based salad with shredded coconut dressing. Sayur means mixing, so sayur urap means mixing any blanched vegetables with spices and grated coconut until it is well blended. It originates from Java with variations all over the country. 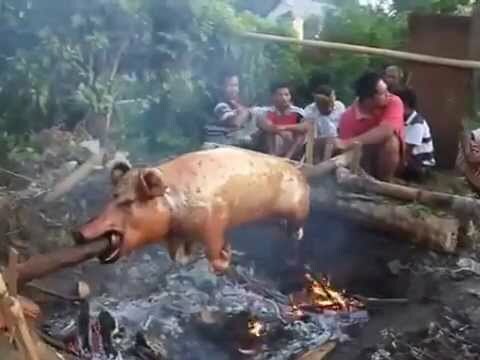 In Bali, it is known as lawar and sometimes meat is used, like pork, so it would be called lawar babi. Check out our recipe for Indonesian sayur urap. Indonesian perkedel jagung are deep fried corn cookies, usually eaten for special occasions such as the birth of a baby or a wedding. They are also popular street food throughout the country and great for vegetarians. Coffee production is big business and Indonesia is the world's 4th largest producer. We are coffee addicts (especially Stefan, Sebastien is more of a wine addict) and after caffeine paradise in Vietnam, we were dead excited to try it here. Each of the Indonesian islands we visited has its own kopi (coffee) beans, producing its own specialty named after it. For example on Flores island, you'll have kopi Flores and on Lombok island, expect some delicious kopi Lombok. Actually on Bali, Java, Sulawesi and Sumatra islands, another type of coffee is sadly very popular: kopi Luwak, made from civet pooh. The cute civet cats feed on coffee cherries but they can't digest the stone (which is the coffee bean) so they poop it out. This is then collected, cleaned and roasted, to produce the most expensive coffee in the world (prices reach £460/$700 per kilogram). 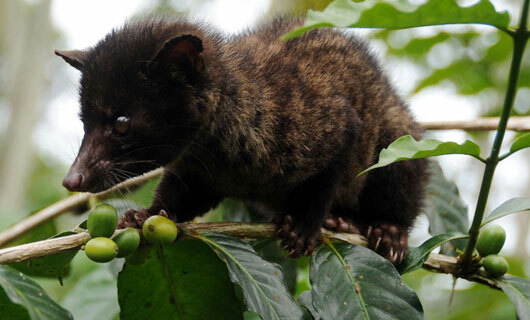 However, civet coffee is regarded more as a novelty and also quite sad. The civets are kept in cages all day like battery chickens and force fed coffee beans. They are deprived of exercise, a proper diet, space to move and therefore quickly die. We decided to just give kopi Luwak a miss, opting for the yummy local island brews instead. Wow! This is a great list of foods. My mouth is watering. One of my favorite parts about travel is the foods! 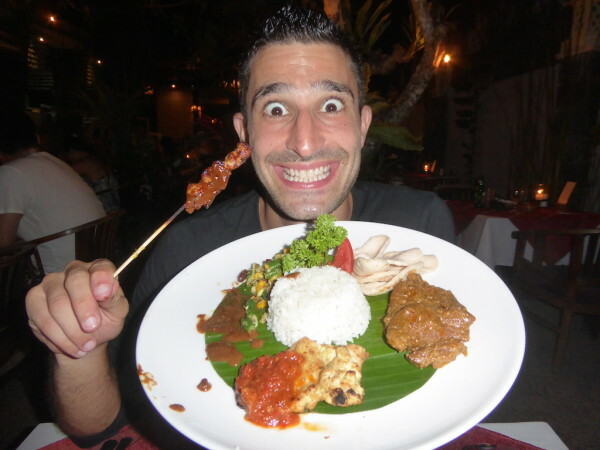 While I really enjoyed Balinese cuisine while there, I have to say, I thought it was slightly overrated (don’t hate me!) I thought the suckling pig tasted like…well, pork. The coffee was fine but I’ve had better elsewhere (In Asia- Cambodia’s coffee is my favorite by far!) but you really just can’t go wrong w/ Satay! We did have an absolutely amazing meal of Mahi-Mahi (I’m not even a fish person) at our homestay in Amed. We caught it with him in the morning and he cooked it up Balinese style that night! I had an introduction on the coffees of Indonesia at Anomali Cafe in Seminyak, Bali and I really want to go on an Indonesian coffee adventure! NIIIICE!!! Now THAT’s an adventure worth doing (I’m a coffee addict and the idea of that is perfect). That is really sweet of you guys. Ok, this just made me hungry!! Everything looks delicious, especially the nasi goreng. Rice is one of my favorite foods, so I would love a plate of that 🙂 Perkedel jagung sounds pretty intriguing, as well! I would happily eat up every bit of those dishes! Yum. The chicken satay on the lemongrass is so good. I really should make that at home! I’m also really eyeing that Sayur Urap. This list makes me very excited to head to Bali next year. I love fried rice so I’m excited to try their version of it and who doesn’t love BBQ in all forms. Going to check out the cooking class you all did as well. Thanks for sharing. Our pleasure Meg – you’ll love it. Wow, those lemongrass chicken satay sticks look fab! Much like Elena I am reading this at the most inopportune moment – there’s a pot of humus and a lemon in my fridge right now – your photos have made my tummy rumble! mmmm I love gado gado and tempeh actually, although I am not a vegetarian. And who doesn’t like the show that goes on for the Rijstafeel. 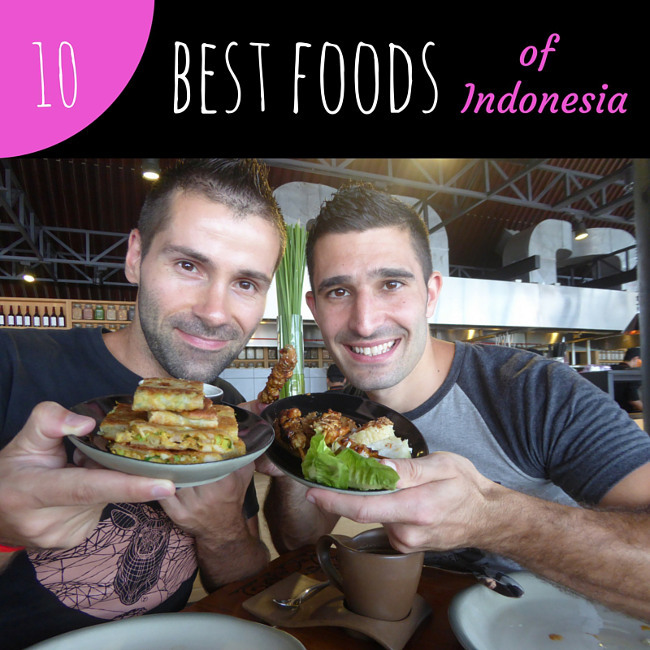 Although Indonesian food is not one of my favorites, there are a few goodies to be had. You guys did a good round up and this has made me extremely hungry! I made a mistake of reading your post about an hour before dinner. The suckling pig was the last straw. I almost fainted and had to find something to eat. Let me tell you, a cup of yogurt, the lone content of refrigerator at that moment, was no match to Indonesian food. Your mouthwatering descriptions accompanied by yummy photos should be preceded by warning about reading at your own risk ;). Seriously, though, my closest encounter with Indonesian food was a dinner at an Indonesian restaurant in NYC. It was a delicious experience and I think my main dish was what you call lawar babi. At least, the description fits. I am looking forward visiting Indonesia one day to try all these wonderful dishes in a local setting. All these foods look amazing. 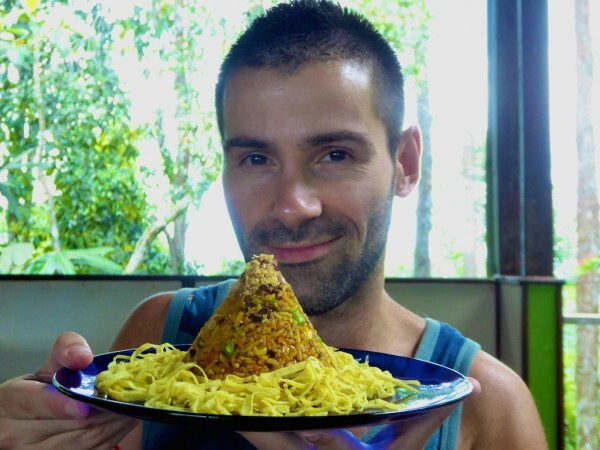 I have only been to Bali and devoured all the Nasi Goreng and Mee Goreng that I could. I am dying to go back for the food, in particular because of the fresh avocado banana smoothies for $1. Ahhhh!! 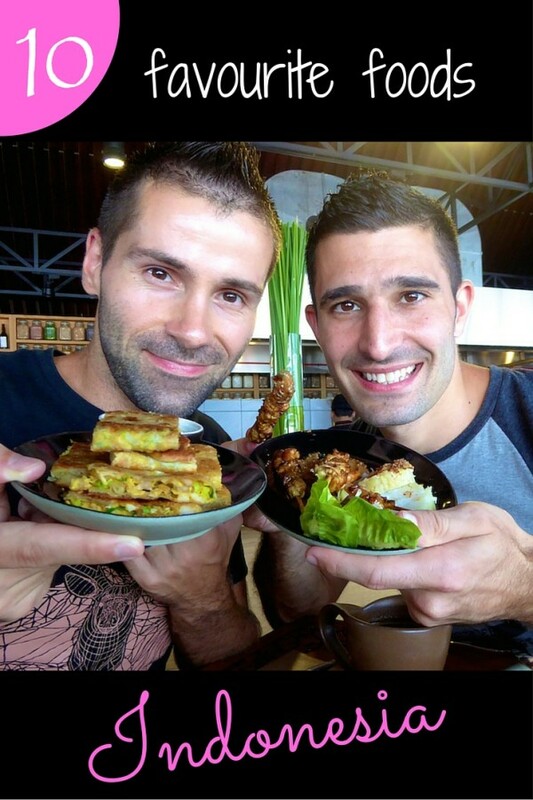 We stayed in Indo for three months and LOVED the food. The babi guling is a lot more flavorful compared to lechon. Gado-gado is my fav thing to eat in indonesia. Can I tell you how obsessed I am with peanut sauce!? Honestly, I would probably put it on everything if I could, even the corn cookies! I have never been to Indonesia but whenever I’m in Europe I try to swing by Amsterdam to get a fix of Indonesia cuisine (since the two countries have a historic connection). I think the European version is pretty tasty so I can only imagine how sublime it would be done authentically and local. Actually that makes sense – we don’t have that much of an Indonesian culture in London, minimal but not visible. But of course it would be huge in Amsterdam!! When I was there, I think I ate either Nasi Goreng or Bami Goreng on a daily basis for lunch and for dinner would choose to all the other tasty dishes. 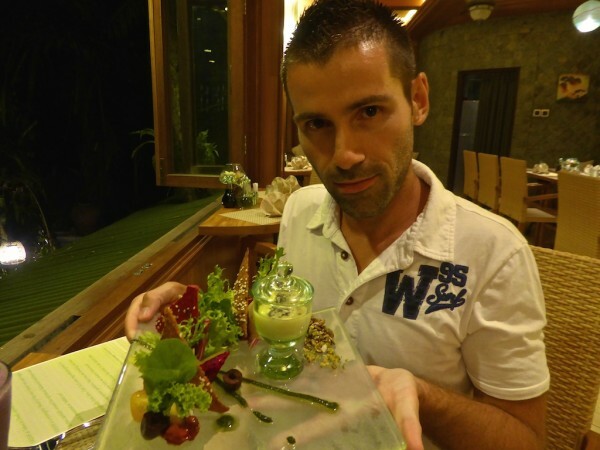 I also loved all the tasty seafood and fish dishes that Bali had to offer! If you are like me, I am sure it was difficult to limit your list to just 10. While I have not been to Indonesia, I have had some of those dishes. Dang, what the heck, I will just go to Indonesia and try them myself. Yum. Call it research. Haha I loved this 🙂 I’m planning a trip to Indonesia for end of 2017. I know :/ ages away. Definitely going to give these a try! Fantastic post, although now I can’t stop my tummy from grumbling! What does tempeh taste like? Is it like tofu or does it have more of a chickpea/hummus texture to it? And awfully sad about those poor little civets. It’s great that you’re making people aware of the problem. Hopefully people will continue to boycott it and it’ll hopefully go out of practice in the near future! Thanks Madison 🙂 Tempeh tastes more Like tofu, except it’s deep fried so it has that fried flavour more then anything.